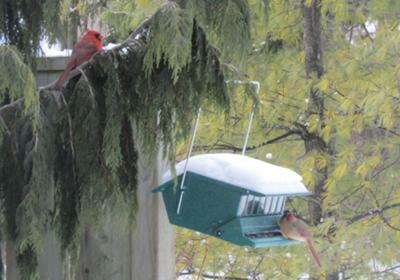 This pair of Cardinals are daily visitors to my feeders, but I've never seen them at the same feeder at the same time. And they were willing to pose ..... for peanuts, so to speak! Thanks for your picture - the Cardinals are lovely! Join in and write your own page! It's easy to do. How? Simply click here to return to Cardinals.